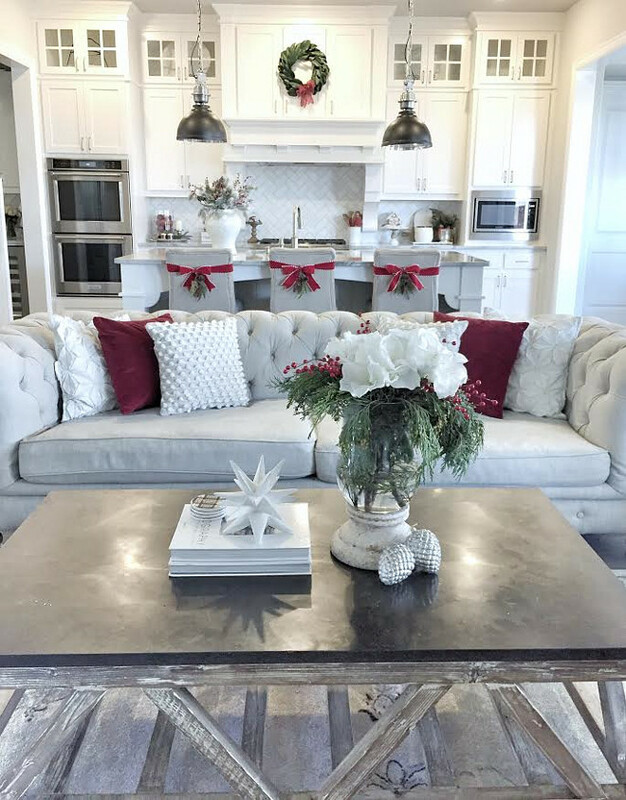 The moment I shared Erin’s home, from @MyTexasHouse, on our series “Beautiful Homes of Instagram”, it not only became a popular post on Home Bunch but it also became one of the most pinned homes on Pinterest. Both Erin and I could never have imagined this much success and we often mention this with so much gratitude to you, my wonderful readers, who made this happen by sharing this with your followers and family and friends. 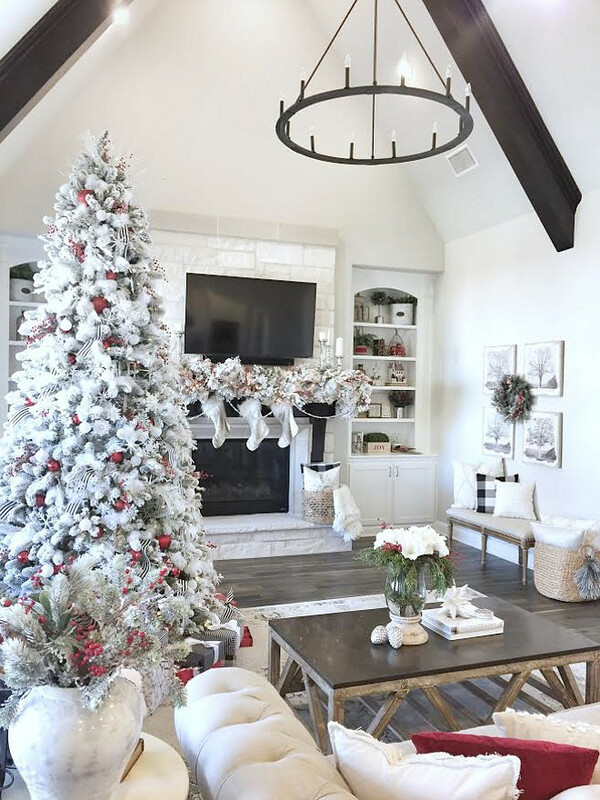 “I’m so thrilled and honored to share with the readers of Home Bunch a look inside my home at Christmas time!! This is my family’s first Christmas in our new home. 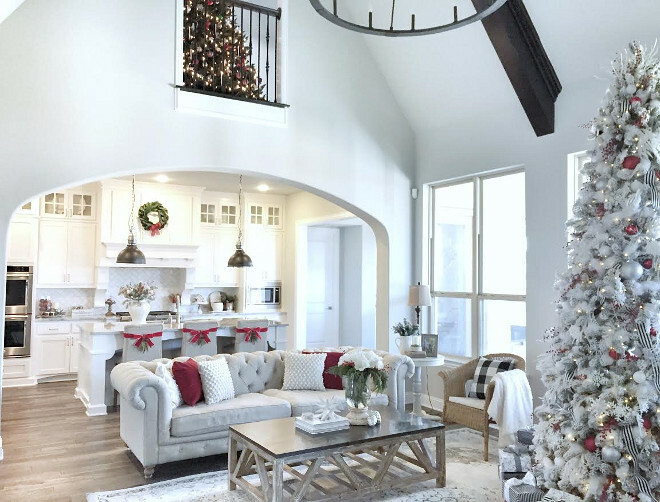 We can’t wait to make new Christmas memories here, while keeping alive the special family traditions that we hold dear. 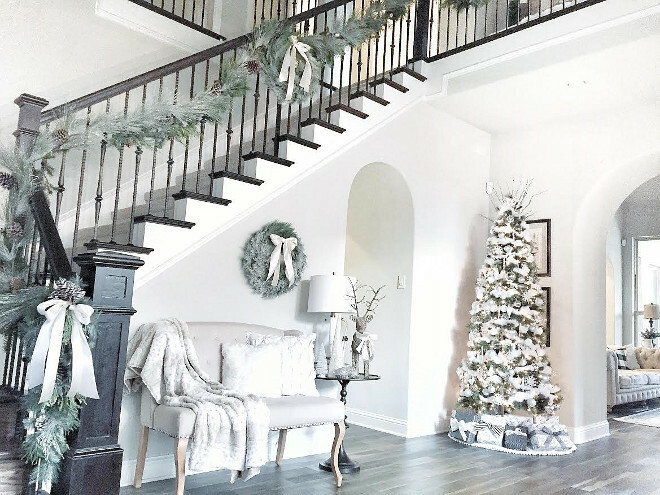 When I started thinking about decorating my home for Christmas, I turned to Instagram and Pinterest for ideas. 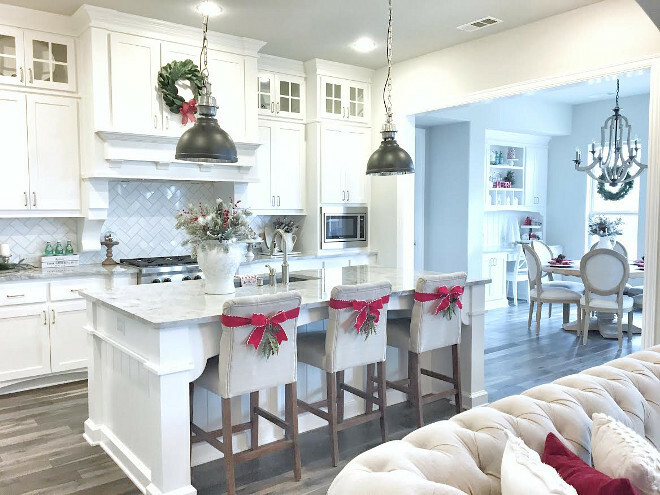 I was really drawn to pictures of homes with pops of red in their Christmas decor, so I decided to go with that idea. 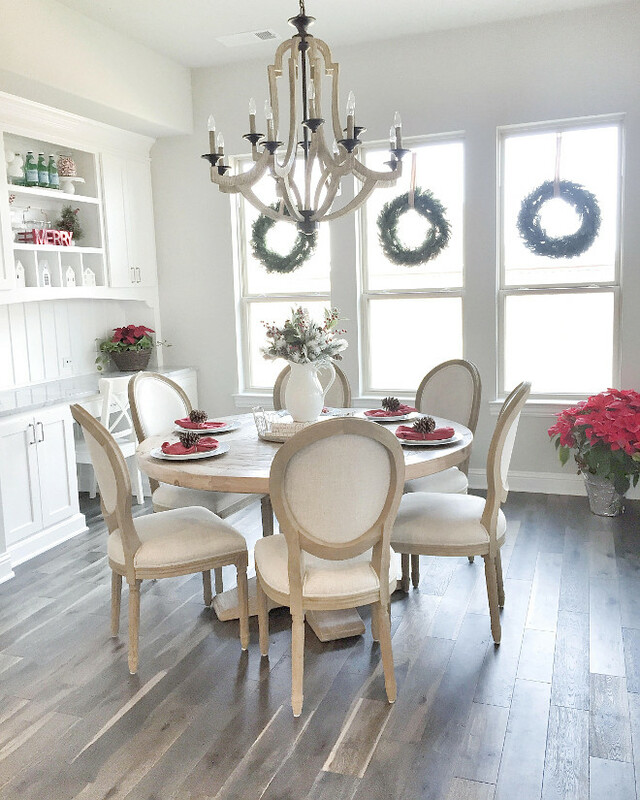 My house is normally so neutral with very little color, and I thought it might be fun to add a splash of color for the holiday season! 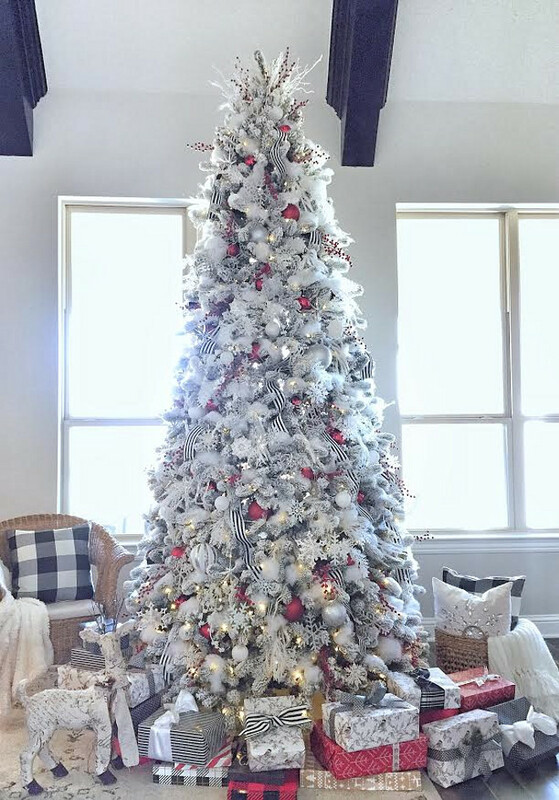 My beautiful new 10 foot flocked Christmas tree from King of Christmas is the definitely the center piece of all my Christmas decorating. 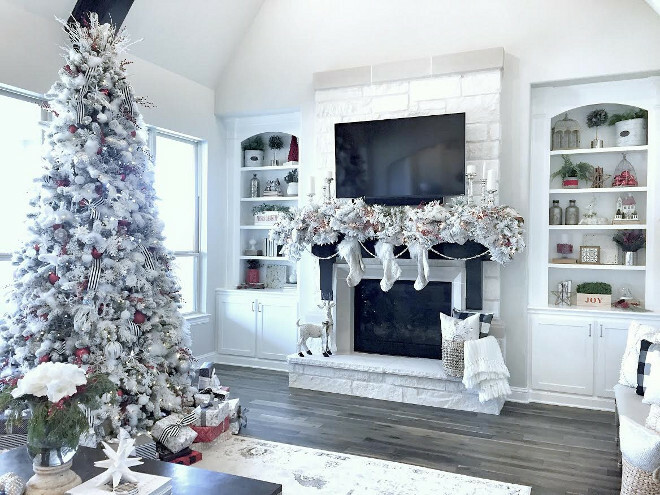 I’ve always wanted a flocked tree and this one is so gorgeous and realistic looking. 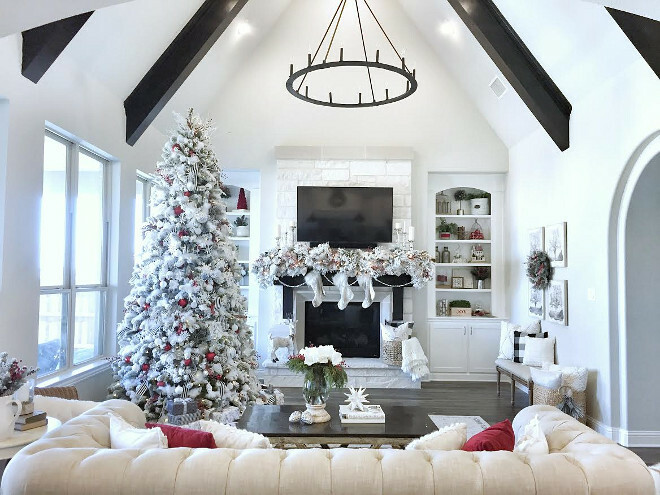 After deciding that I would decorate my tree in a traditional style, with red and white balls, snow flake and shiny ornaments, I decided to add some black and white striped ribbon to add a little modern twist. 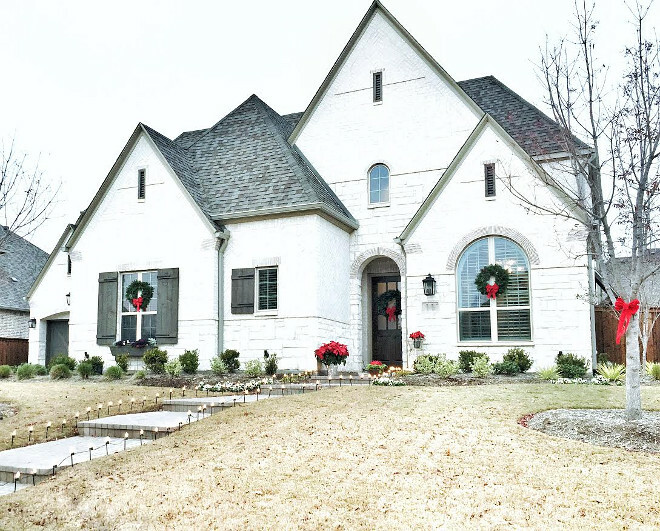 Outside, we decided to go simple and traditional decor as well, we added pops of red with bows on the wreaths and some red poinsettias! The wreaths are real and I purchased them at Costco. 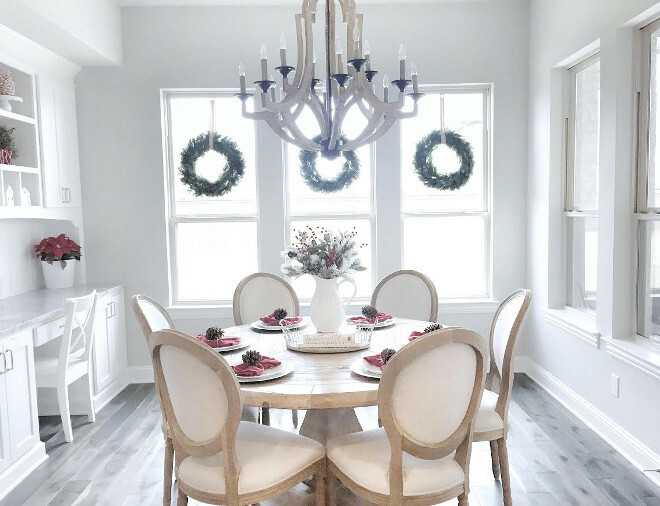 In my entryway and dining room, I decided to keep with a neutral palette. For the banister I wanted the garland to stand out, so I took two different types of garland from Michael’s and layered them on top of one another. 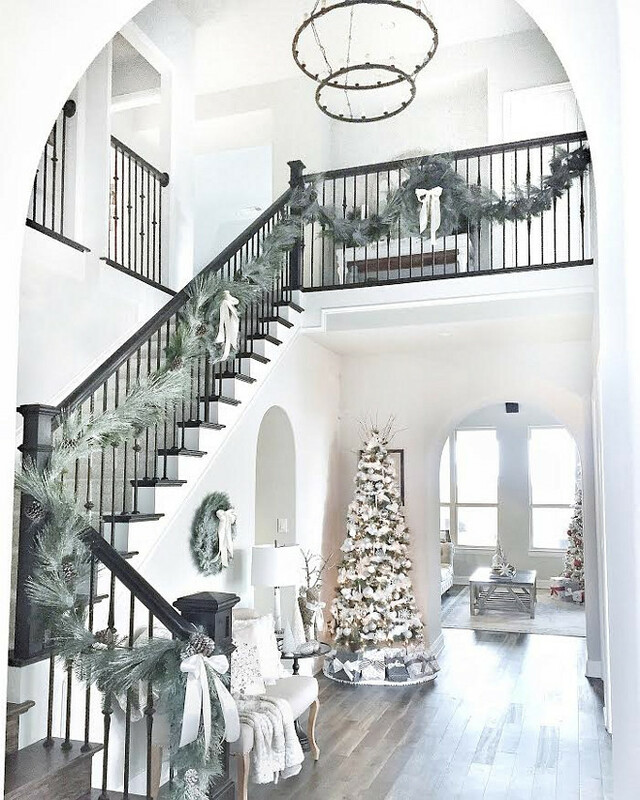 I did a little diy project on the wreaths I hung on the banister. I bought them from Michael’s several years ago and I wanted a more flocked look, so I sprayed them with artificial “snow” spray. I added ivory ribbon to the garland and new throw pillows on the bench to complete the look for the entryway! Christmas Tree, Bench and Pillows: Target. Black Side Table: World Market. Grey wall paint color is “Sherwin Williams Repose Gray“. 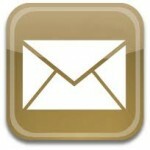 Flooring: Kentwood Floors engineered oak wood floors. Style is called Oak Iron Springs and the color is Wild Thing. 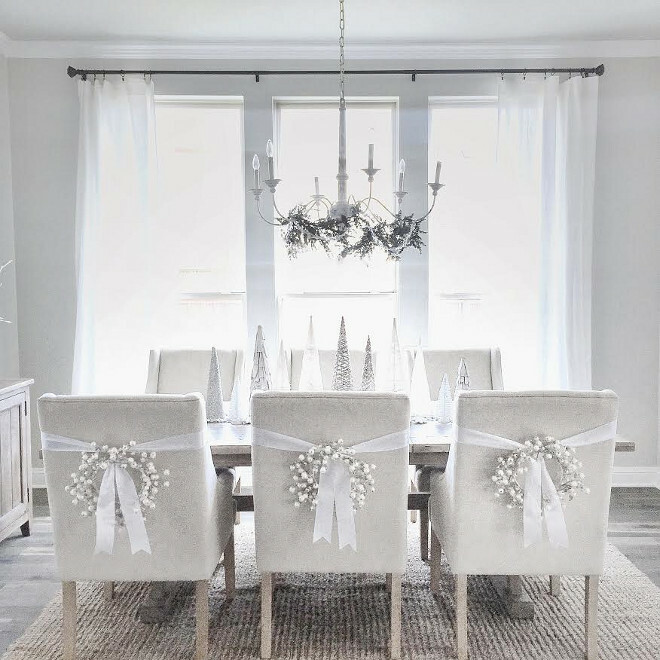 Erin’s dining room has been pinned thousands of times on Pinterest. 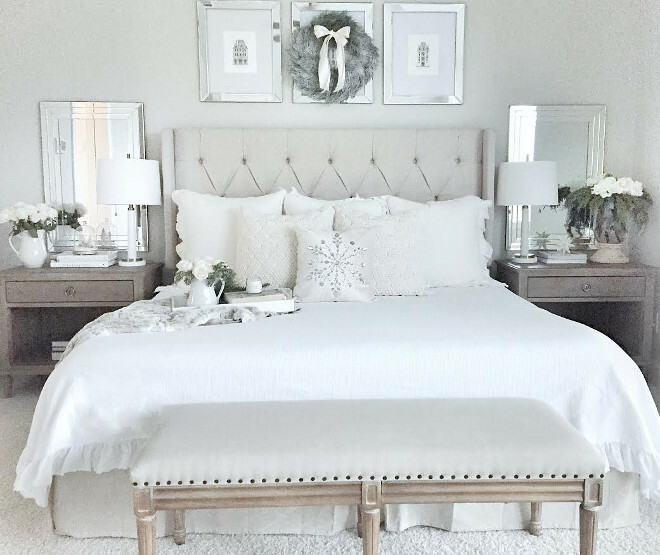 The neutral color palette and simple decor is an elegant choice. 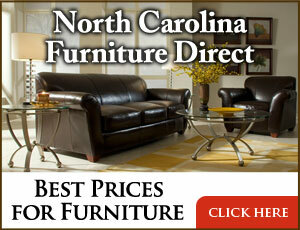 Dining Table: Nebraska Furniture Mart. Rug: Savevieh Natural Fiber rug. 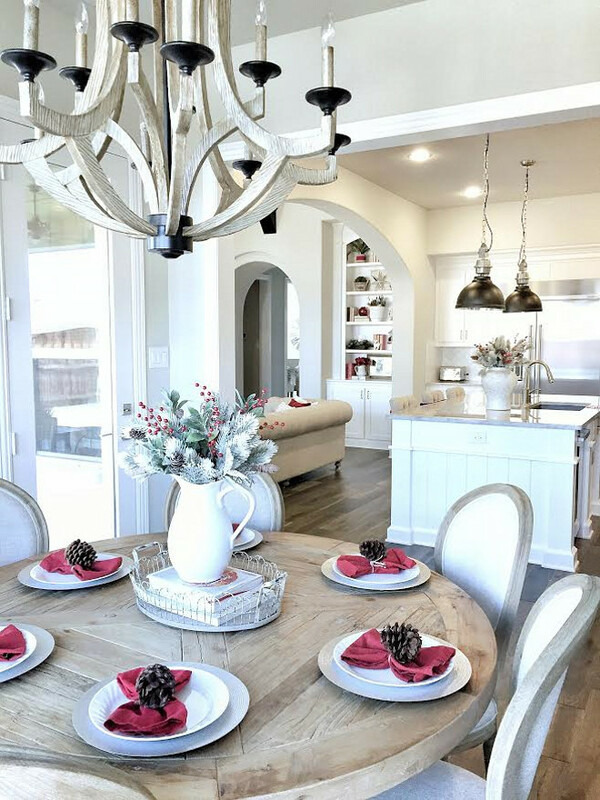 The distressed chandelier is from Visual Comfort. 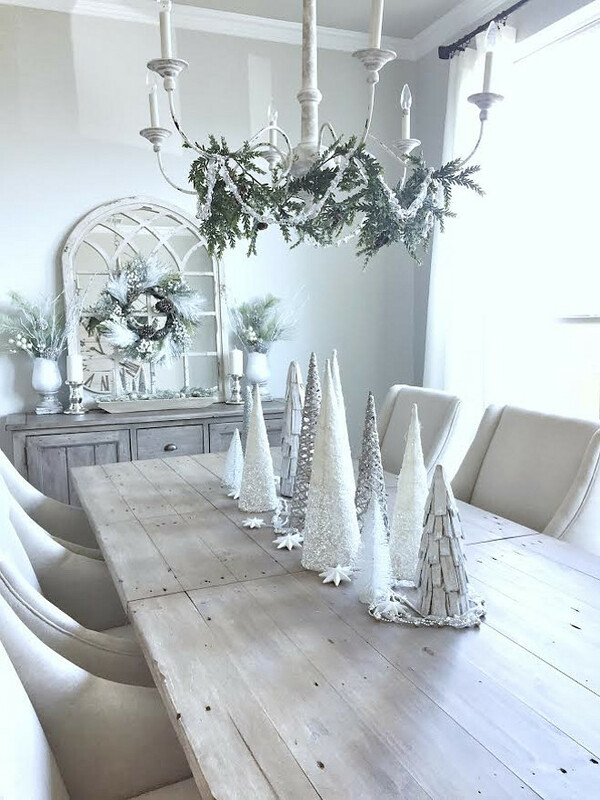 I have been collecting decorative Christmas tree of all sizes and thought they would be the perfect centerpiece for my dining room table. Christmas Trees on Table: collection from several different stores including Target and Joann’s. How impressive! 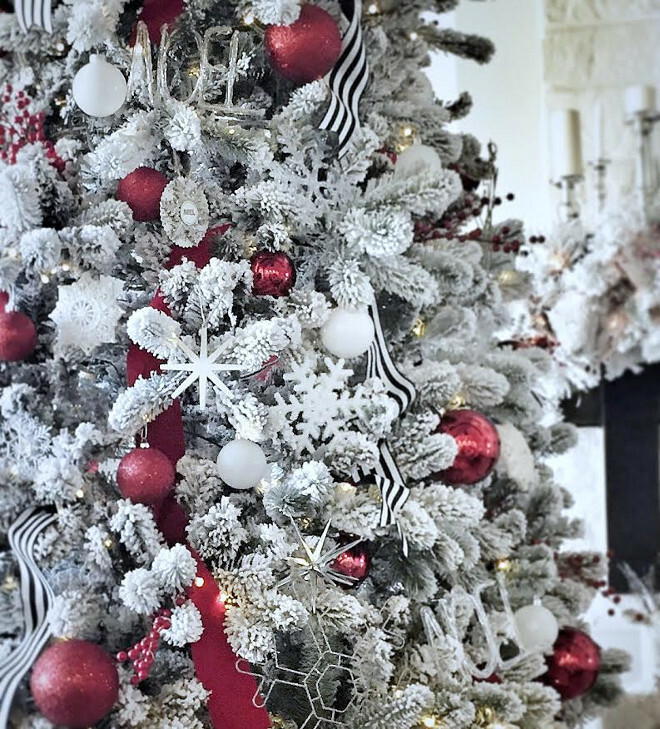 Christmas Tree: 10′ flocked tree: King of Christmas. 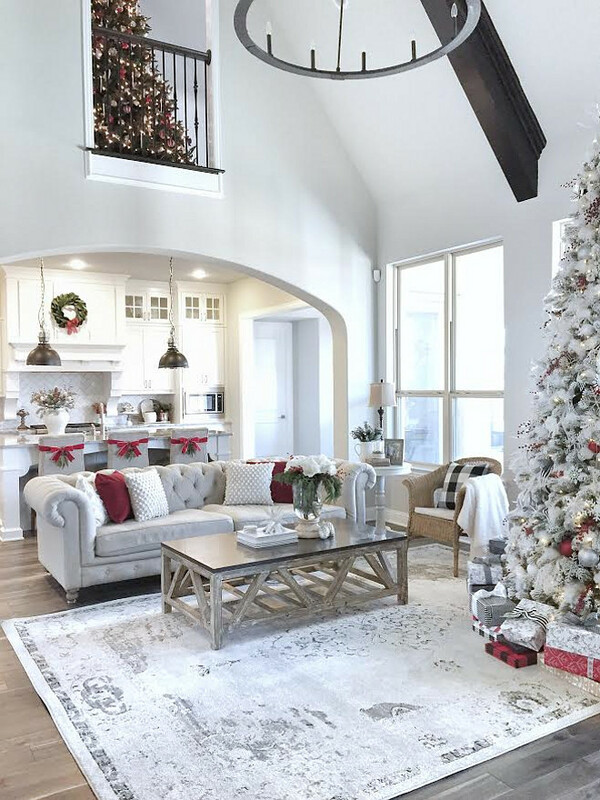 I love the pops of red on this fairly neutral Christmas tree! Chandelier is Capital Lighting Pearson Chandelier. Rug is from Rugs USA (Treasures ZG13). The white side table was a garage sale find. Lamp is Kirklands. 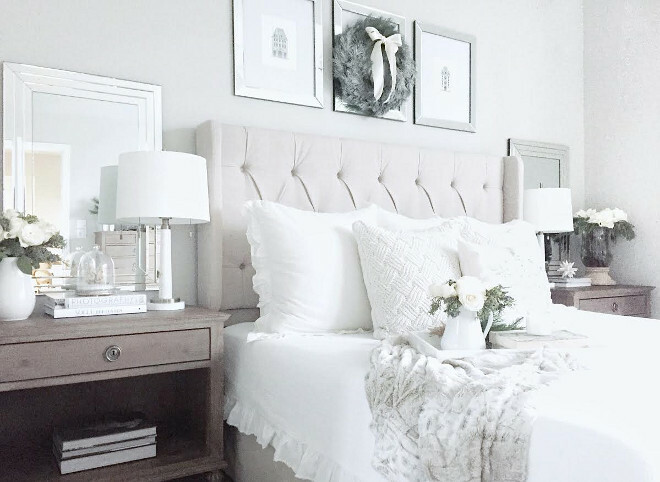 This neutral color palette gets exciting at this time of the year. Wall paint color is Repose Gray by Sherwin Williams. All pillows and fringe throw are from Target. Beams and mantle is custom made and stained a dark brown/black color called Ebony by DuraSeal. 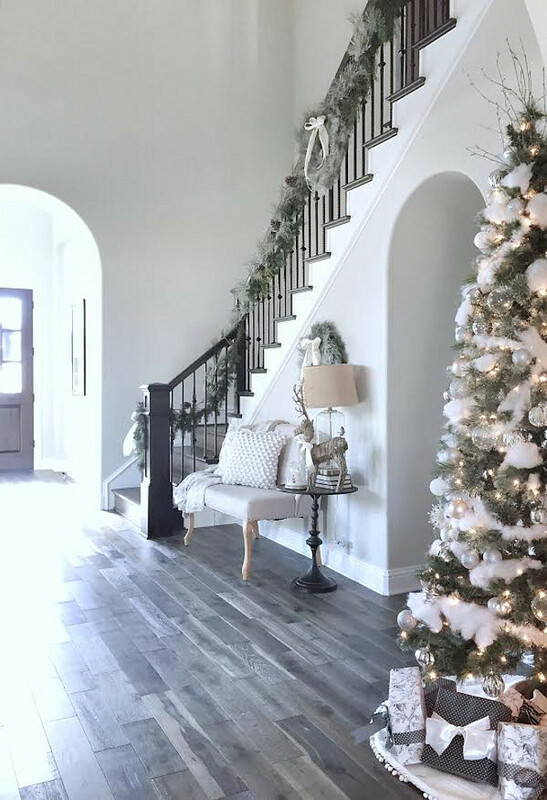 The flocked Christmas tree coordinates beautifully with the flocked garland on the mantel. My mantle garland is amazing! I purchased it at a local store in Arlington, Texas called Decorator’s Warehouse. 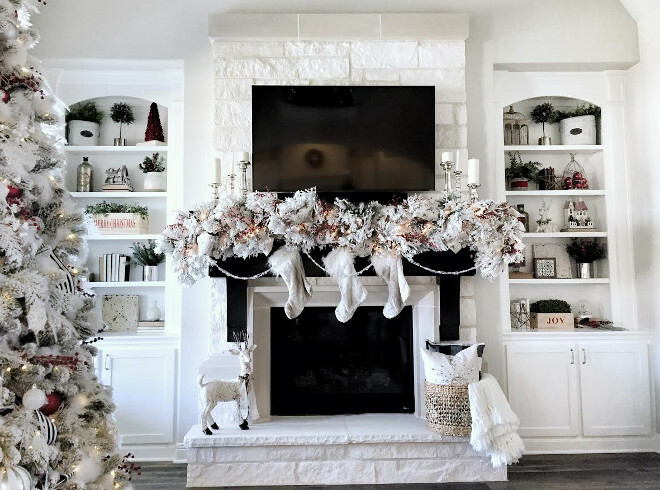 When I saw this huge flocked prelit garland there, I knew it was perfect for my large mantle. Getting it to stay up there was no easy feat however! It is very heavy, so I used six command strip hooks, wrapped rope around the garland and secured the rope to the hooks. Luckily it hasn’t moved since I put it up! Reindeer on Mantle: Michael’s (last year). Faux Fur Stockings: Pier 1. 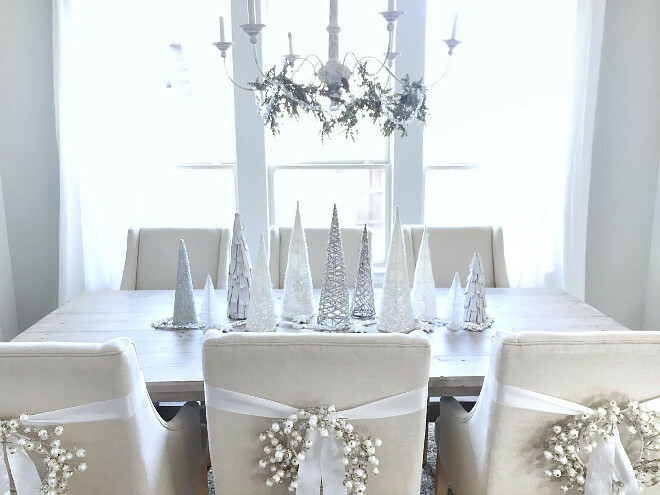 Silver Candle Holders: IKEA and Pier 1. I love how Erin brings her Christmas color palette to the bookcases as well. Crystal Snowflake Pillow: Pier 1. 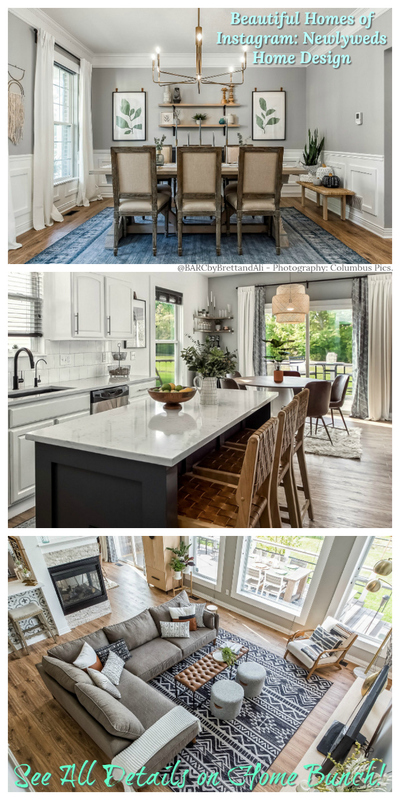 It’s easy to see why so many people love Erin’s home, right? 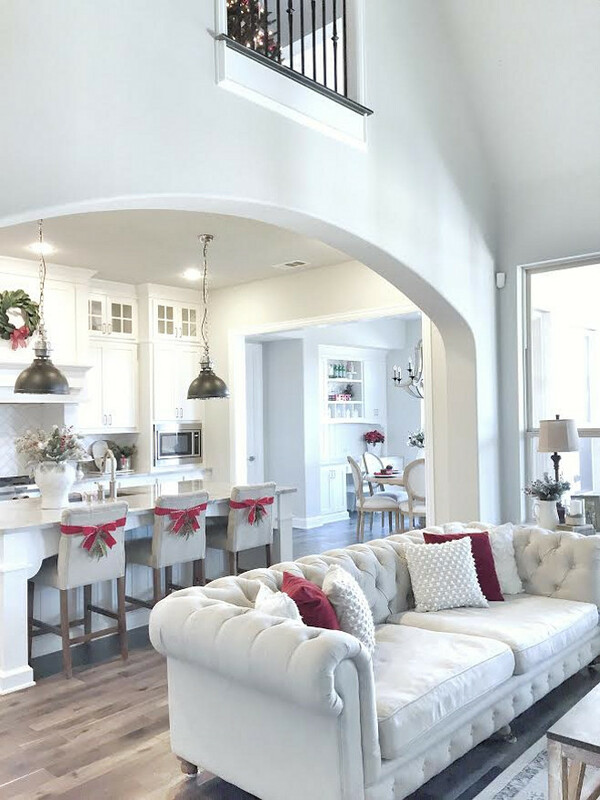 A neutral paint color and cathedral ceilings create an airy feel to this open layout. Sofa is from Restoration Hardware. 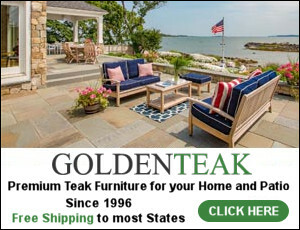 Coffee table is Nebraska Furniture Mart, Timeless Designs Old Fir and Blue Stone coffee table (Nebraska Furniture Mart). 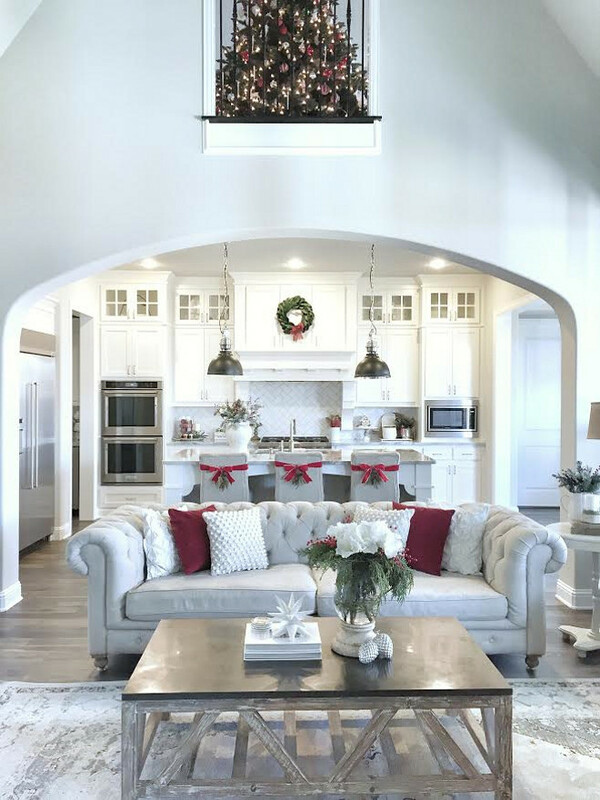 This home is full of inspiring design ideas, which includes this open concept kitchen featuring an archway to the living room. 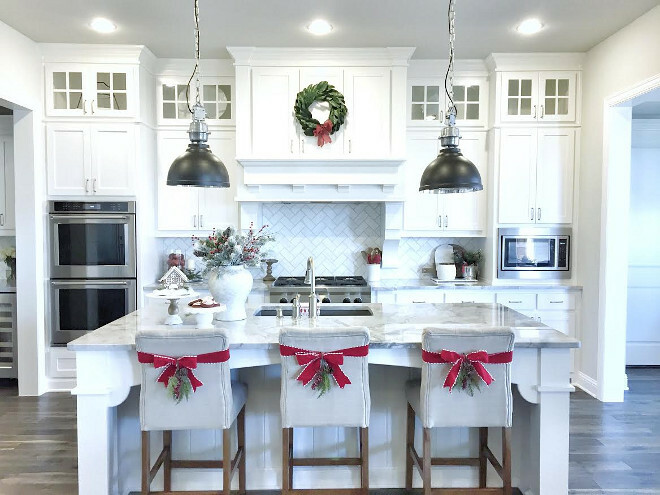 In my kitchen, I added a Magnolia leaf wreath from Target on the vent hood and bows on the backs of the counter stools to give the space a cheery and festive feel! 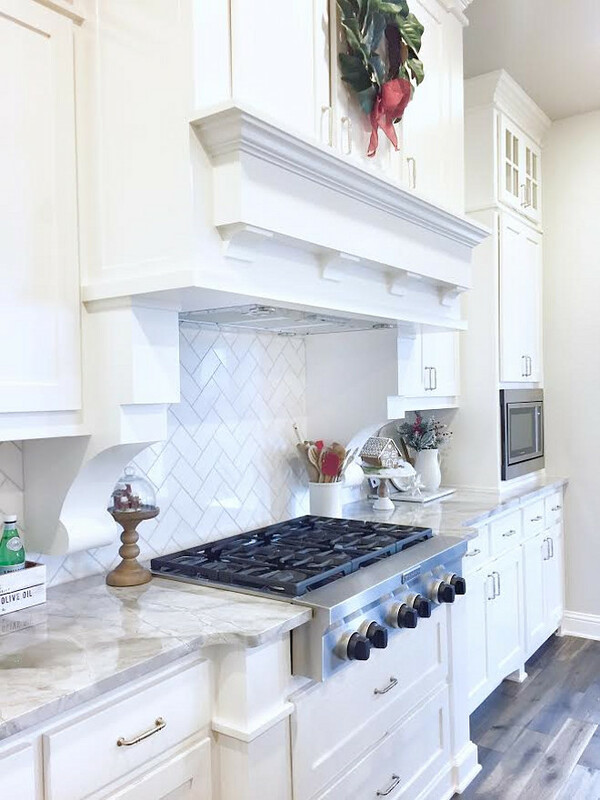 The kitchen backsplash is Daltile m313 contempo white marble 3×6 tile laid on herringbone. The grout color is platinum. Range is Kitchen Aid Professional 36″ six burner gas cooktop. 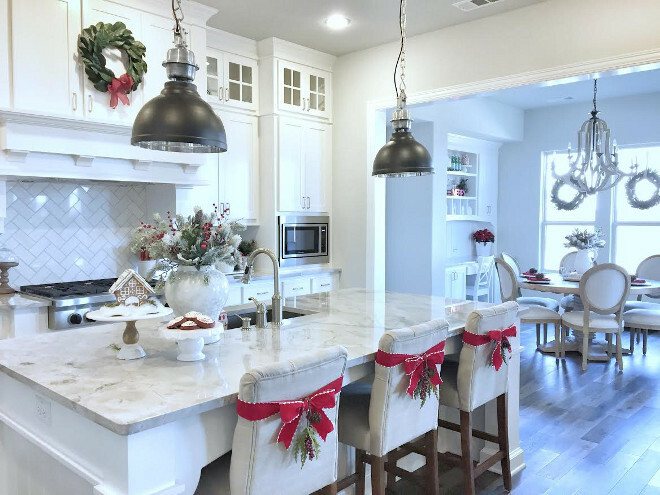 This kitchen, with its large island, has the perfect layout for my little assistants to pull up a chair and help decorate their own Christmas cookie creations. Large Vase: House of Jade Interiors. The faux stems in vase are Hobby Lobby. 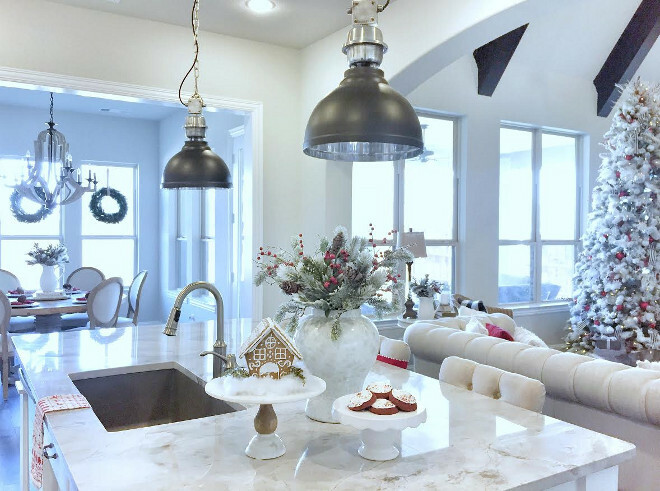 We love baking cookies and decorating gingerbread houses every year at Christmas time. 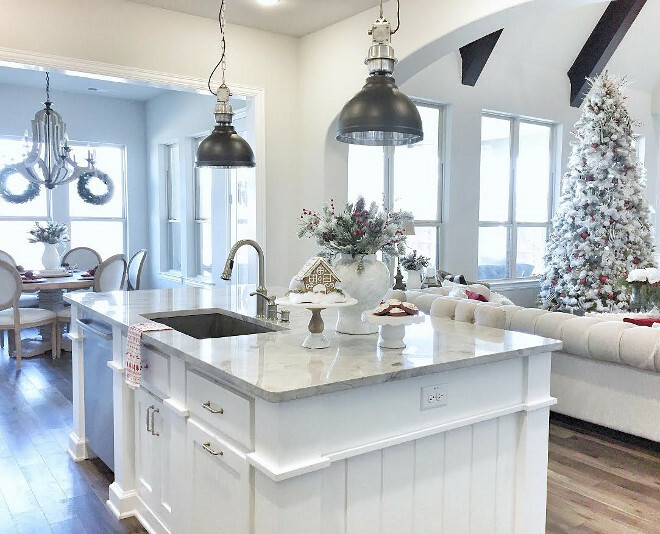 Kitchen island countertop is Superwhite Quartzite. 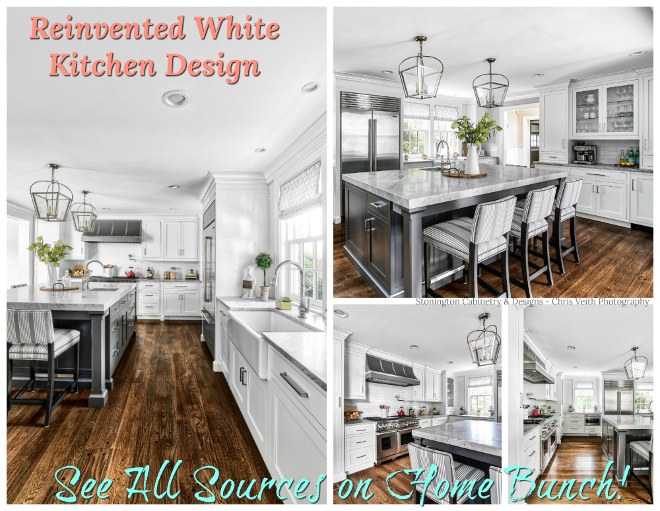 Kitchen Island paint color is Sherwin Williams Pure White. 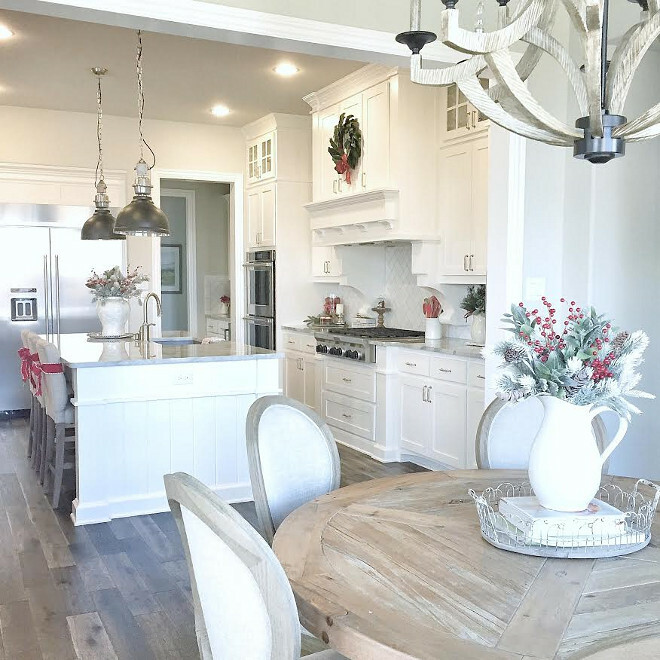 Kitchen island lighting is from “Magnolia Market” in Waco, TX. Cake Stands: (tall) Homegoods (small) Target. This kitchen nook is full of great ideas, from its layout to its decor! Flooring is Kentwood Floors engineered oak wood floors. 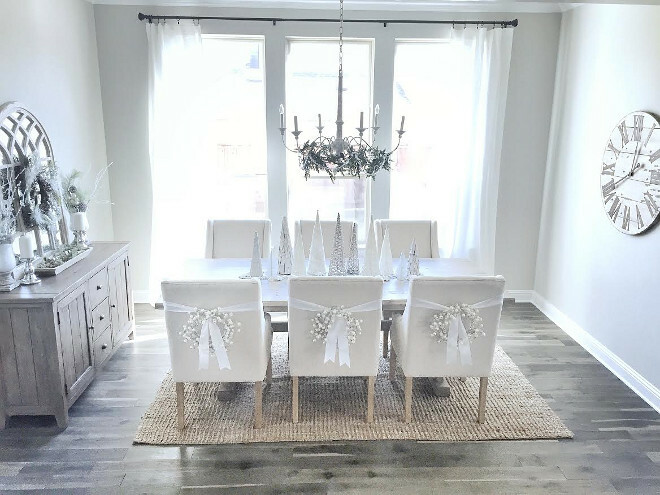 Kitchen Nook Chairs: Restoration Hardware. Round Table: Nebraska Furniture Mart (no longer available). 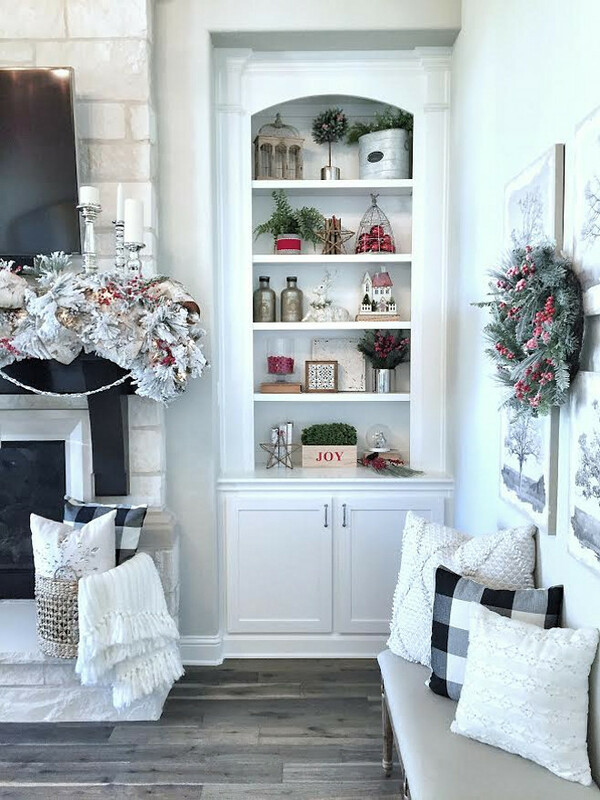 Simple pine cones add a Christmassy feel to the kitchen nook. The vase on the table is from Target. Wreaths are from Hobby Lobby. 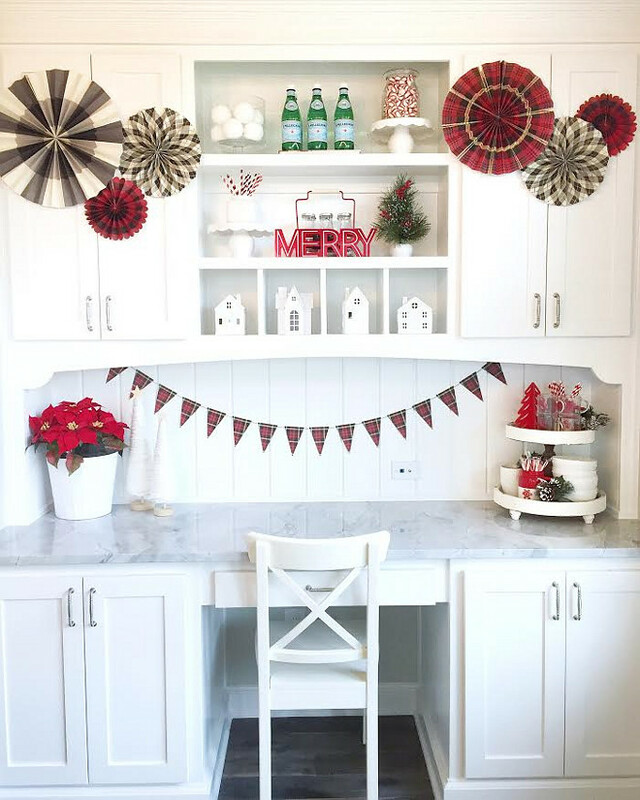 The kitchen nook also features a great desk, beautifully decorated for Christmas. 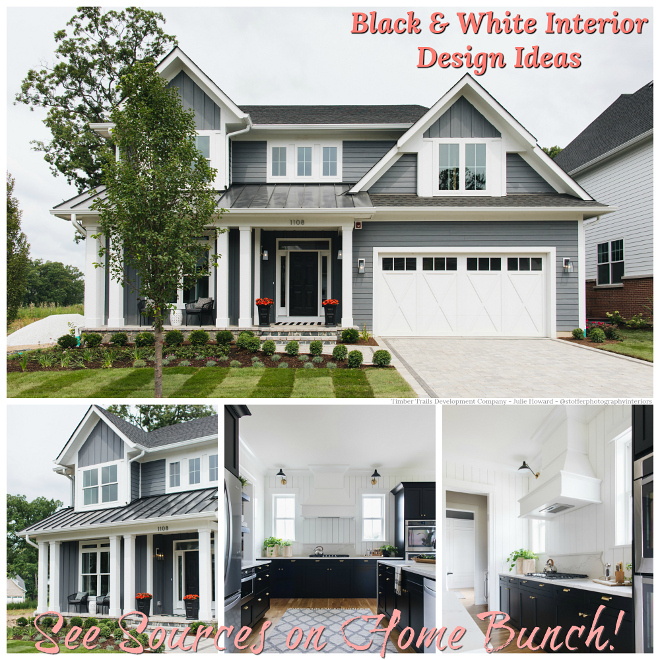 Kitchen Color Scheme: Kitchen cabinet paint color is Pure White by Sherwin Williams. Kitchen wall paint color is Repose Gray by Sherwin Williams. 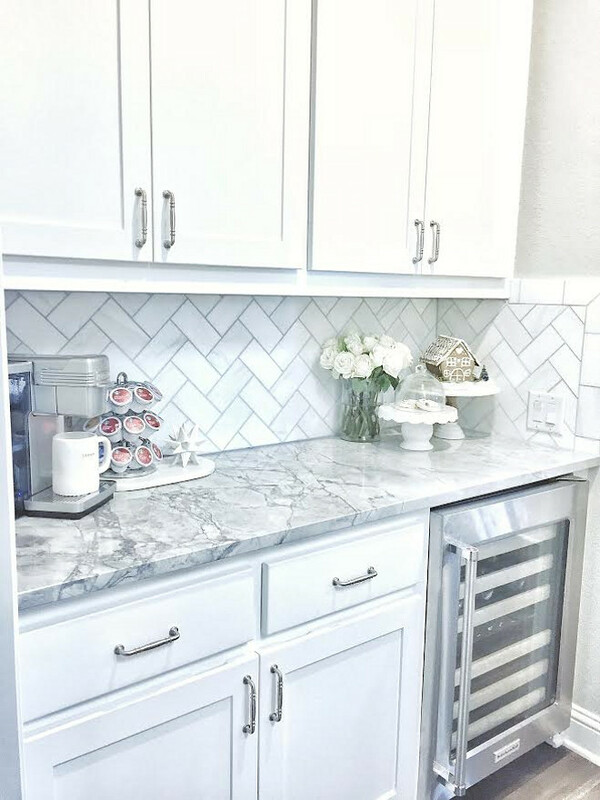 The wet bar features white cabinet, herringbone backsplash and white quartzite countertop. 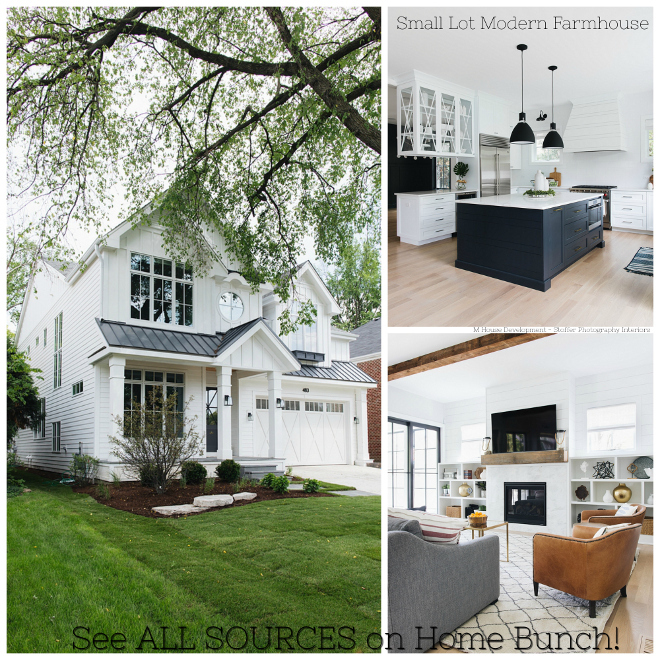 This is one of my favorite farmhouse-inspired kitchens ever published on Home Bunch. 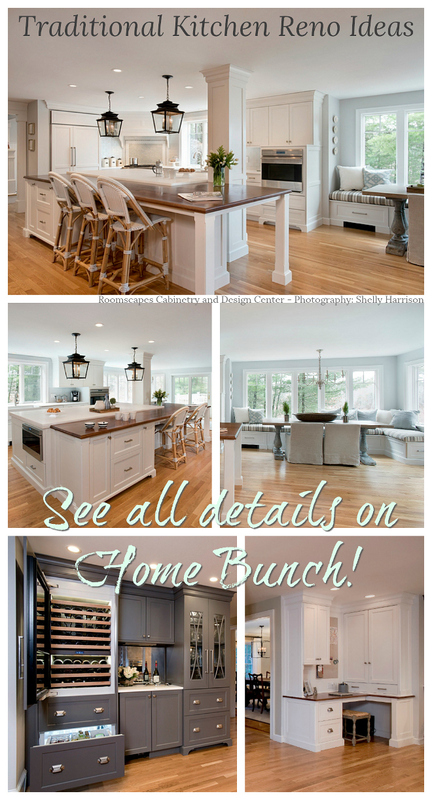 The layout is perfect for entertaining! 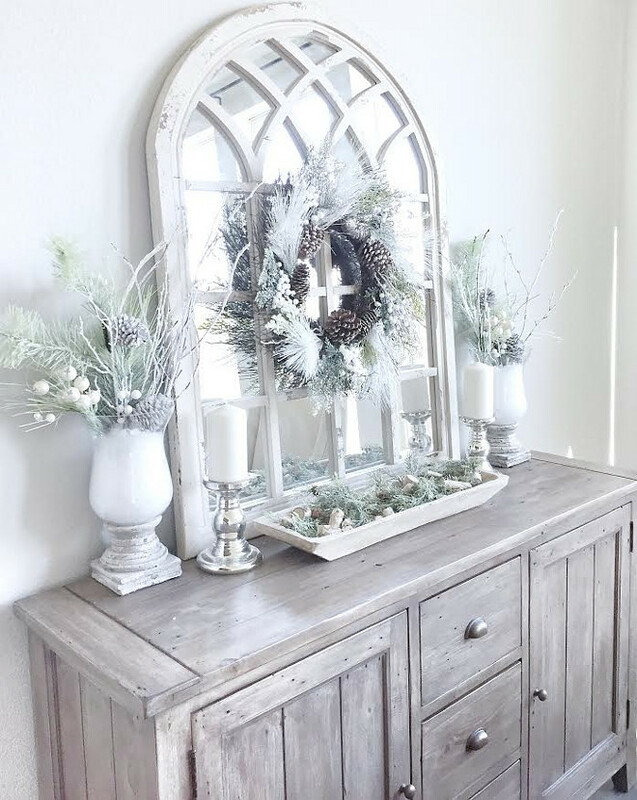 In my bedroom, I used some new pillows, a wreath, and some greenery to give the space a simple but still festive feel! 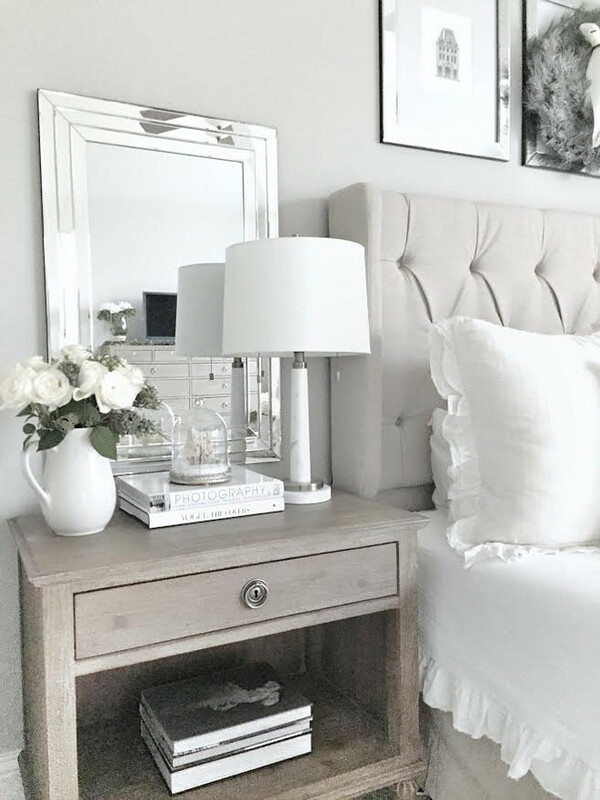 This is a simple and elegant way to style your nightstand. This bedroom is so inviting! Bedding is from Homegoods and shams are from Anthropologie. Headboard is from Wayfair and throw is Pier 1. 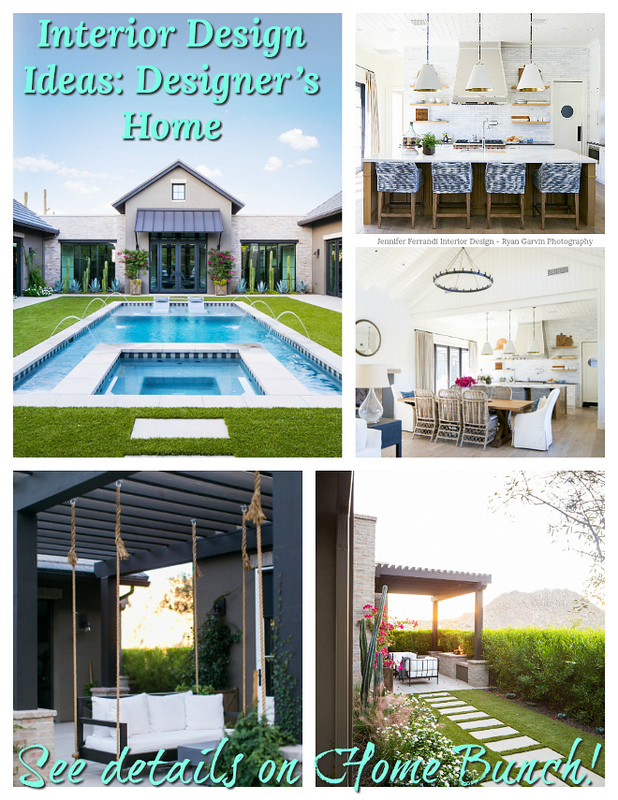 For the complete house tour with all of details such as furnishings, decor, paint color and many more pictures, make sure to see it on Beautiful Homes of Instagram. 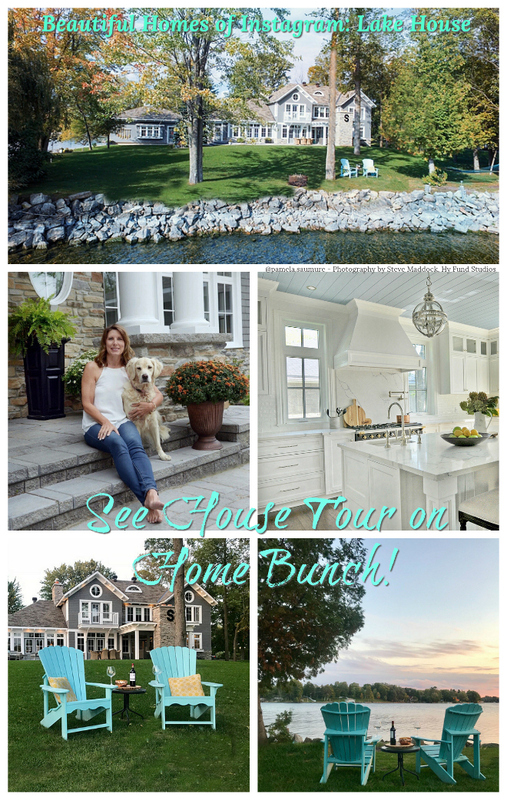 Thanks so much, Luciane, for sharing my Christmas Home Tour! So honored to be featured again on your amazing website! Merry Christmas! !